An encoder cable transmits encoder output, which may include multiple channels, to a control device. Encoder cable signal transmission can be degraded by many factors including, long transmission runs, high cable capacitance and extreme EMI. Properly specified, your encoder cabling can compensate for all three of these issues. Twisted-pair wiring minimizes inductance and capacitance in the cable. Installing this type of encoder wiring is particularly important over long distances. Use a minimum of 24-gauge wire. Shielding is essential for noise immunity. A cable that is shielded overall is the bare minimum but in a high-noise environment, individually-shielded wires should be considered. For very high-noise environments, differential encoders with differential wiring provide an effective way to filter out noise. For very long distances, consider strengthening the signal with a repeater or encoder splitter. Choose a connector that provides the environmental protection you require along with a balance of ease-of-use, cost, size, and availability. For high-noise environments, a differential encoder may be an appropriate solution. In these designs, a differential line driver generates two outputs for each channel: the normal signal and its complement. Any noise spikes will appear in each signal, enabling the receiver to filter it out as common-mode noise. Implementing this scheme requires two wires for each channel. Absolute encoders transmit absolute position as a multi-bit digital word. They can be connected using parallel wiring, fieldbus, or point-to-point wiring. The number of conductors needed for each type varies. Successful encoder to drive communication depends on the ability of the encoder to send a stream of clean voltage pulses to the receiver. Particularly if the readout device is using more sophisticated techniques such as edge detection on a quadrature encoder, it is important that the signal consists of square pulses with a good signal-to-noise ratio. The voltage level of the pulses is also important. Some drives and controllers have thresholds for voltage detection, and will not detect pulses below a certain voltage. Several factors degrade signal quality, the two most important being transmission distance and noise environment. Electrical cables suffer from capacitance, inductance, and resistance, all of which act to cause a voltage drop. High capacitance increases the RMS current draw of the cable. The longer the travel, the greater the effect. To maximize signal strength, the first response should be to locate your receiving device as close as possible to the encoder. Beyond that, there are several things you can do with encoder cabling to improve performance. Start by specifying the best quality low-capacitance cable you can afford. Every cable has capacitance but the lower it is, the less of the signal you will lose in transit. Increased capacitance raises the RMS current draw of the wire and the higher the current draw, the lower the signal. In addition, generating more amperage triggers heating in the output driver of the encoder. Too much can throw the encoder into thermal shutdown. The right cabling can reduce or suppress noise, delivering strong encoder signals even in a very noisy environment. Dynapar recommends some form encoder cable shield for all applications. For best performance, each individual wire should be protected. The most common type of shielding is a foil jacket with a drain wire. Used around the cable, this provides adequate performance at an economical price. Braided shielding delivers better performance. Another key noise-suppression method is to choose twisted-pair wiring. This type of encoder cable cancels inductance and helps prevent cross-talk. For differential encoder signals, a twisted pair of cables can be used to carry the encoder signal and its complement. For a high-frequency, high-speed application, twisted-pair wires individually foil wrapped and collected into a cable protected by a braided-wire shield will provide superior performance even in a high-noise environment. The connector can become the weakest link in the cable if not correctly specified. 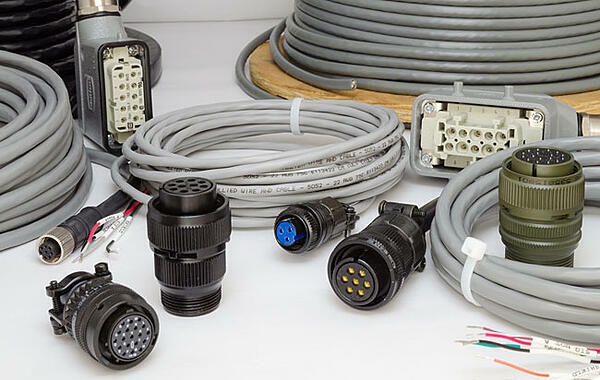 Unless directly terminating a pigtail, after selecting the right encoder cable, there are still several factors to consider when choosing a connector including environmental protection, ease-of-use, size, and cost. For sourcing flexibility and future field replacements, connector commonality should also be a consideration. As with many industrial applications, environmental considerations take precedence. In conditions with high contamination or moisture, an M12 or latching connector will typically provide good protection and are fairly common. Next, consider mechanical and installation requirements. Latching connectors are bulky but are easy to install in the field with just a screwdriver. M12 connectors are compact but require soldering.